Dr Ramaiya is the Consultant Physician and Chief Executive Officer at Shree Hindu Mandal Hospital, Dar es Salaam, Tanzania. Dr Kaushik Ramaiya is an internationally recognized medical expert on health care systems for infectious and non-communicable diseases in Tanzania and sub-Saharan Africa. 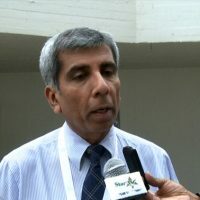 Dr Kaushik Ramaiya was the Chair of the International Diabetes Federation (IDF) Africa Region from 2000-2006 and Vice President of the International Diabetes Federation from 2007-2012. He also holds several other honorary appointments such as Hon General Secretary of the Tanzania Diabetes Association (TDA), Tanzania NCD Alliance (TANCDA) and the Association of Private Health Facilities in Tanzania (APHFTA). He is also member of the Board of World Diabetes Foundation.